Happy French Friday! We’re back to fish this week, and also back to me having to make a dish for myself. The only shellfish that gets eaten by everyone around here is crab, and Winter Ceviche features scallops. Luckily, Winter Ceviche was easy to scale down for one and pretty quick to make. Most of the preparation time was spent letting the scallops marinate in a mix of lemon, lime, and mango juices. This recipe has an interesting mix of ingredients and flavors. I already mentioned the citrus-mango marinade. Once the scallops are done marinating, they are served atop a bed of fresh tarragon leaves lightly drizzled with olive oil. Next, halved grapes are strewn on top after a quick dip in the marinade. Finally, the whole thing is topped with thinly sliced shallots that had been marinating in a mix of sherry vinegar and sea salt. I enjoyed eating Winter Ceviche. The mix of flavors was unusual, but delicious. It was very refreshing and almost summery, which was great in the middle of winter. I doubt I will make this again since I’m the only one who will eat it, but it was good. I will be out of town this weekend without wi-fi (the horror! ), so I won’t be reading blogs or able to monitor my comments. I have a fun weekend planned with friends and family back in my home town of Seattle. 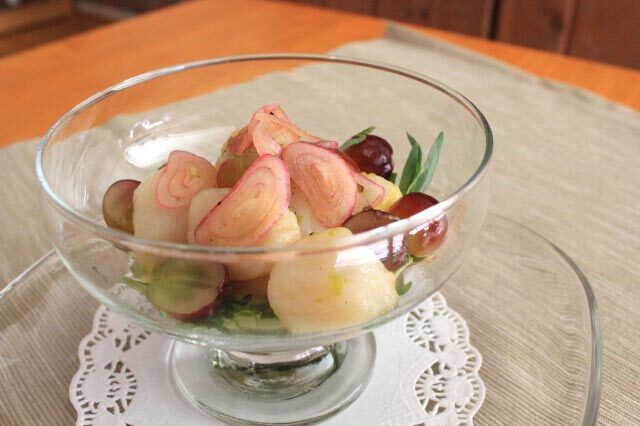 This post participates in French Fridays with Dorie, an online cooking group cooking our way through Dorie Greenspan’s wonderful book, Around My French Table. Happy Friday! This week for French Fridays with Dorie I have the week’s selection plus a make-up from November 2010! I am slowly working my way through the recipes I need to catch up on, and now I only have 7 left. Five of them are desserts. I would like to get all the desserts made before Dorie’s new book comes out and we start in on those recipes. This week’s recipe was little savory tartlets called Scallop and Onion Tartes Fines. They start with a base of puff pastry. After the base is baked, they are topped with a mix of chopped bacon and golden onions. Finally, thinly sliced sea scallops are placed on top, and the tarts are baked just long enough to slightly cook the scallops. Since I am the only scallop-eater in my family, I only made one tart with the scallops. The rest were topped with mozzarella cheese (Gruyere would be wonderful, but I used what I had). The real star of these little tarts is the bacon-onion topping. Oh, my it was good! First the bacon was cooked until crisp. After it is removed from the pan, some of the drippings and a bit of butter were used to slowly cook the onions until they were soft and golden. Add the bacon back in, and you have a wonderful topping! So, I ate my scallop-topped tart, and half of a cheese-topped tart. I have to admit, I preferred the one with the cheese. My husband and daughter really liked their cheesy tarts, so I think that is the way to go unless you can find super-fresh scallops. Since we did not have a dessert in March’s line-up of recipes, I decided this was the perfect month to catch-up on one of the desserts I have left to make. Caramel-Topped Semolina Cake is made from farina (aka, Cream of Wheat) with a caramel sauce baked along with it, “upside-down”-style. Doesn’t this cake look pretty? Oops! I had trouble getting the cake out of the pan. So, this was an interesting little cake. I liked the flavors, even though I burned my caramel sauce slightly. The texture was kind of pudding-ish. I wish I hadn’t struggled to get it out of the pan. While I liked it, I doubt I will make it again as I would rather spend my dessert calories on other sweet treats. I have never used farina, but now I am intrigued by the idea of using farina in desserts and for breakfast. I found a farina pudding recipe that looks interesting, and a breakfast cereal that looks good. What did the rest of you think of this recipe (if you can remember that far back!)? August seems to be flying by! I know it’s only the 10th, but it feels like the month is over already because so much is happening in the next couple of weeks. Before I know it, my daughter will be back to school! I skipped last week’s French Fridays with Dorie recipe partly because I was on vacation (yay! ), but mostly because I am waiting for our garden tomatoes to be ready. I will be making it (tomato-cheese tartlets) as soon as I can! 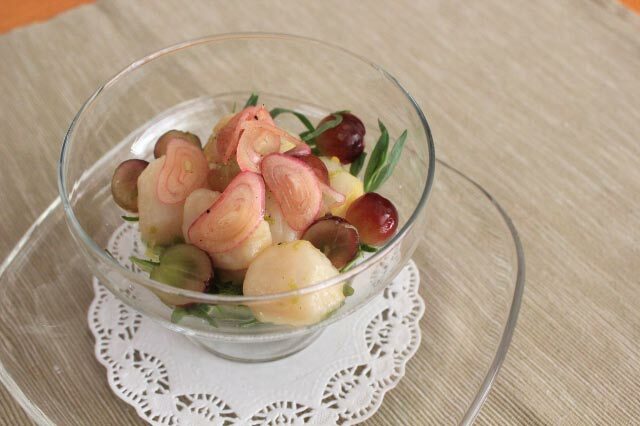 This week’s recipe is a perfect summer meal called Warm Scallop Salad with Corn, Nectarines, and Basil. 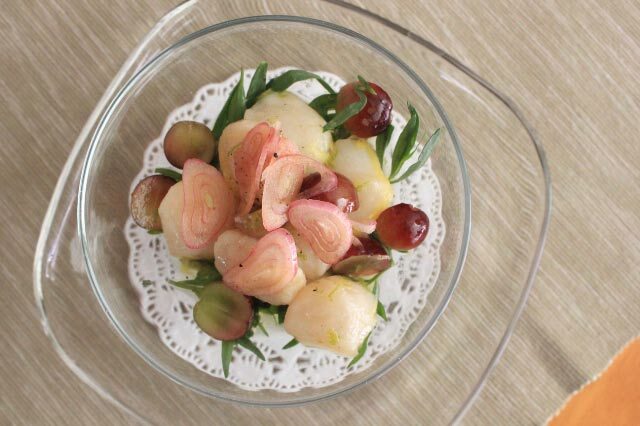 To make the recipe, nectarine halves and sea scallops are quickly grilled and plated. Scatter the plate with fresh corn and halved grape tomatoes, then drizzle with lime dressing. Finally, dot the scallops and veggies with basil coulis (kind of like pesto, but without the garlic, cheese, and pine nuts). The only change I made to the recipe was to briefly cook the corn because I don’t really care for it raw. My husband and I (I’m sure you guessed the hot dog plate belonged to my daughter) really like the veggies with the lime dressing and basil coulis, but we both felt the flavor of the nectarine didn’t really go with the rest of the dish. I cooked the scallops perfectly and really enjoyed them. My husband said the chicken went well with the flavors too. I can see making the corn and tomatoes with the lime dressing and basil coulis as a side dish to any number of main dishes, particularly fish or chicken. This was a perfect meal for the hot week we are having!